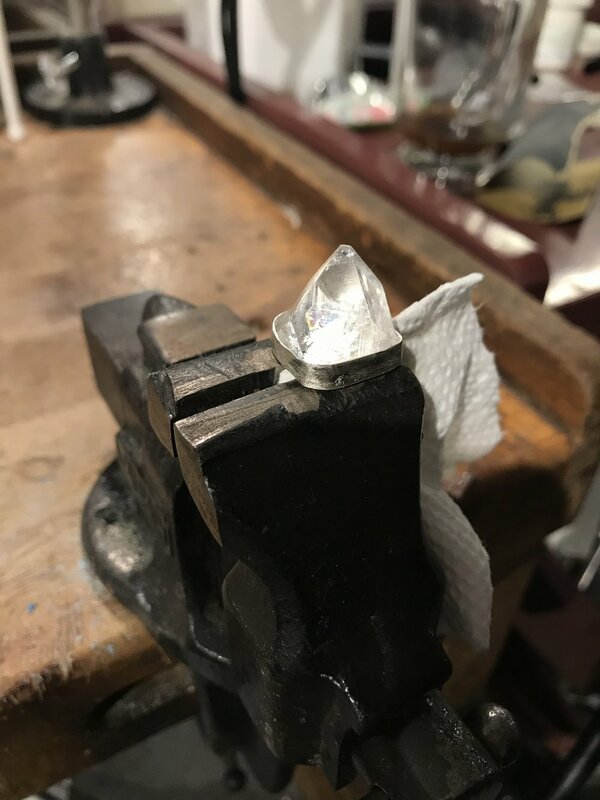 Before I started fabricating the link chain I have come up with a strategy to streamline the fabrication process; and of course, regardless of how much you plan, there are always unanticipated road blocks throughout the design process. I designed a jig to use as a template for bending the 10 gauge wire so, ideally, I’d form the link and solder it shut at one point. Unfortunately, it wasn’t as simple as I originally planned because the wire was too thick to bend even after annealing it; instead of bending one wire into a link, I had to create two halves and solder them together. This turned to be a bit wasteful but luckily I didn’t pre-cut all the links; insufficient leftover wire will be recycled for another project. Even though the initial method to wrap the wire around the jig didn’t work as planned, the jig was still a crucial object used to confirm that each link is consistently the same. After cutting each piece of the link and matching them together, I used medium and hard solder to connect them together. First using the hard solder that melts at 1,365°F (741°C) and then medium solder that melts at 1,275°F (691°C) for the second connection point. We’ve all heard the saying practice makes perfect; when you do something over and over again, you start seeing opportunities for streamlining your processes by combining repetitive tasks and processing pieces in batches. At first, I thought to myself, “Why not combine two halves into one?” but it was a challenge to balance the two halves interlocking another link all while trying to solder because the heat would expand the metal and move them slightly apart. It was difficult to get consistent placement from link to link which resulted in inconsistent seams that had to be filed down aggressively creating uneven overall gauge thickness in individual links. In an effort to simplify the process, I have developed a system where I solder the links only at one seam and bend them open along the axis that keeps the faces of the second seam parallel to each other so they’re on the same plane. This fabrication system is scalable so I can make as many links as I need. Once I have enough open links, I can insert them through one another, bend them shut and solder the open seam… so on and so on until I reached the desired length of the chain. In addition to the challenge of hand fabricating a chain, I wanted to add a special element to it so it doesn’t end up being just a link chain you can buy from Home Depot. I decided to bring back the White Apophyllite pendant from the archive (2015). The pendant is connected to the chain with a custom designed link that was 3D printed in castable wax and cast using traditional investment casting process; see pictures below for a close up view. Thus far I’ve made one link chain necklace with a White Apophyllite set with a bezel, and two bracelets because I lost the first one (don’t ask). I loved the bracelet so much that I decided to re-create it after I lost it AND go all the way and make a matching necklace. Although I love working with my hands and there’s a high level of satisfaction fabricating a product (almost) entirely by hand, it is undeniably a very long and tedious process. So another thing I love to do besides working with my hands is discovering ways to manufacture things more efficiently by streamlining processes along the way. That being said, I used Rhino to design a wax tree of interlocking links for investment casting. The tree is scalable on the Z-axis and can be taller with more links depending on the height of the flask; it is also rotationally geometric and can fit two sections of the chain like a double helix of DNA. The tree also feature an open link at the end that can be used to connect one chain to another to lengthen it or it can be used to connect it to another components (perhaps a clasp). Instead of having to solder each link together (twice), now there’s only one soldering point per batch. This solution has decreased the amount of soldering necessary to connect the links which in turn has dramatically decreased the amount of cleaning necessary to finish the chain.